How Many People Abuse It? Adderall is a central nervous system stimulant that is prescribed to treat symptoms of attention deficit hyperactivity disorder (ADHD). Many students use the drug non-medically to stay awake and study. Other people may use it to lose weight or simply for its effects of euphoria. Symptoms of Adderall addiction include tolerance, withdrawal, consistent failure to quit or cut down on use, cravings to use the drug, and spending large amounts of time obtaining the drug, using it, and recovering from its effects. Long-term abuse of the drug can lead to kidney damage, insomnia, intranasal damage from snorting it and marital, financial and personal problems. Who Answers? to find a rehab center and get more information on treatment programs near you. Adderall is a brand name for a prescription drug that contains a compound of both amphetamine and dextroamphetamine. It is typically prescribed to treat symptoms of attention deficit hyperactivity disorder (ADHD) in children, adolescents and adults. Adderall has also proved effective in treating narcolepsy. Adderall carries high potential for abuse and dependence. It is a popularly abused recreational drug due to its stimulant effects–which can include euphoria, heightened alertness, reduced fatigue and improved sense of well-being. Individuals who have developed a dependency to Adderall or other stimulant medications may require specialized substance abuse treatment, as they are at increased risk for experiencing depression and suicidial thoughts upon withdrawal from the drug. Adderall is a central nervous system stimulant. It works in part by first increasing the release of and then blocking the reuptake of the neurotransmitters norepinephrine and dopamine. As a result of obstructing the reuptake process, concentrations of norepinephrine and dopamine build up, producing intense sensations of gratification and euphoria. Inpatient or residential. Inpatient programs involve living at the treatment center for anywhere from 30 days to 90 days or longer. You or your loved one will receive intensive care that includes group and individual counseling, detox and medical monitoring. Outpatient . This type of treatment does not involve living at the rehabilitation program. You come to the center on certain days of the week for a few hours at a time. Outpatient includes many of the same services as inpatient. 12-step programs. Twelve-step programs such as Pills Anonymous or Narcotics Anonymous give you the opportunity to complete a successive series of recovery activities with a sponsor. Dual diagnosis. Dual diagnosis facilities can treat an Adderall addiction in addition to any mental health problems you or your loved may be struggling with. 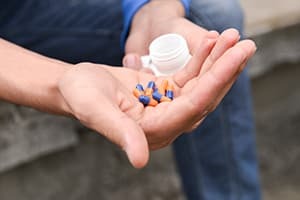 Some people who develop an addiction to Adderall were originally prescribed it for ADHD, and the ADHD needs to be addressed during treatment along with other mental health conditions the user may have such as depression or anxiety. Besides deciding on an inpatient or outpatient program, there are some other things you’ll want to look at in a substance abuse treatment center. Here are a few other things to consider in an Adderall rehab program. learn what your insurance covers and get more information on treatment options by calling 1-888-319-2606 Who Answers? . If you don’t have insurance, the Substance Abuse and Mental Health Services Administration’s helpline can help you find a program in your area. People abuse Adderall to increase alertness, focus and attention. Adderall has a calming effect on individuals who suffer from ADHD–it helps them fidget less and focus their attention. However, Adderall is often misused and abused by individuals who do not suffer from ADHD. They either don’t have a prescription or they take the drug in a different way from how it was prescribed. Individuals may crush the pills, then snort the drug or inject it directly into the blood stream, which can produce even more intense sensations of euphoria. This is extremely dangerous. Feel its effects of increased alertness, focus and attention. Stay energized and focused during sports practices or games. Lose weight due to its effects in appetite suppression. When taken orally, effects of the immediate release form of Adderall can be felt approximately 30 minutes after administration and peak effects of the drug occur approximately 3 hours following administration.2 Adderall also comes in an extended release form (Adderall XR). While the effects of Adderall XR are also generally felt within an hour, peak effects of the drug occur about 7 hours following administration. Individuals seeking a faster effect are more likely to snort the drug or dissolve it into a fluid, then inject it. These methods of delivery allow the individual to feel the effects of the drug within minutes. Doing so also allows users to bypass the extended release safety built into the pill and results in delivery of the full dose of the drug instantaneously–increasing the risk of overdose. Phlebitis or inflamed, often collapsed veins. HIV, hepatitis and other infectious diseases. Skin inflammation, infection and/or abscess at site of injection. Adderall is an amphetamine, so its withdrawal symptoms are similar to other amphetamines. Symptoms can begin anywhere from a few hours to a few days after use has ceased, depending on the severity of addiction, length of time abused and dosage taken. Feeling of unease or dissatisfaction. Who Answers? to speak to a treatment specialist about finding the right rehabilitation program for you. 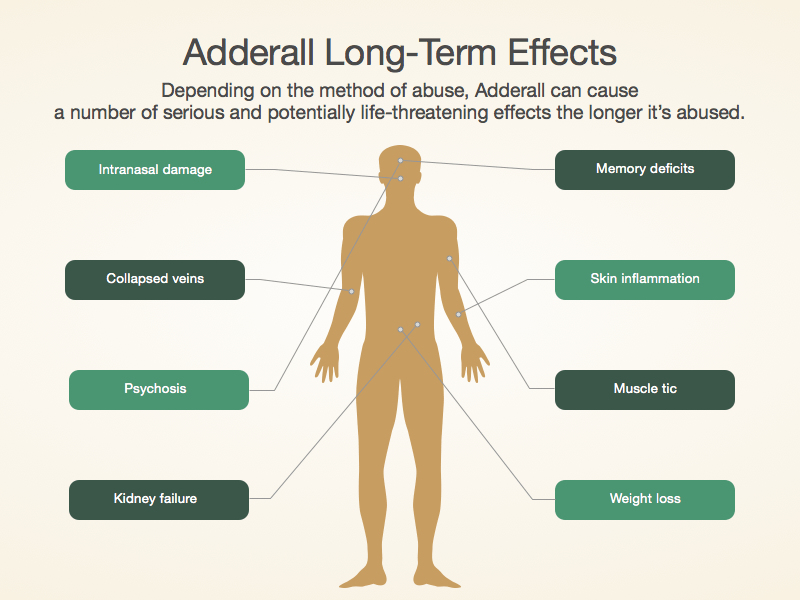 Consuming Adderall in larger doses or for longer than intended. Consistent failure to quit or cut down on Adderall use. Spending excessive time acquiring, using and recovering from the effects of Adderall. Consistent Adderall use despite inability to meet school, work or home responsibilities. Continued Adderall use despite social or interpersonal problems caused or aggravated by drug abuse. Abandonment of hobbies in favor of Adderall use. Using Adderall in physically dangerous situations. Continuing to use Adderall despite physical or psychological problems that may have been worsened or caused by Adderall use. Tolerance (needing more of the drug to achieve the same effect). Adderall is classified as a Schedule II controlled substance, which means that it is tightly controlled due to its high potential for abuse and risk for dependence. Nonetheless, stimulants are among the most widely prescribed medications on the market. In 2008, approximately 6.4% of college students (age 18-22) misused Adderall. Of abusers, nearly 90 percent reported being binge drinkers. Additionally, college students who abused Adderall were far more likely to have used marijuana, prescription painkillers, cocaine and prescription tranquilizers than their counterparts who did not misuse Adderall. According to one study on college students, 13.3% of freshmen, 17.9% of sophomores, 20.1% of juniors, and 16.1% of seniors used prescription stimulants such as Adderall without a prescription. Overdose can occur with Adderall, resulting in an overstimulation of the central nervous system. Overdoses of stimulant medication can lead to very serious cardiac problems, including hypertensive crises, cardiac rate and rhythm abnormalities, or even sudden death from cardiac arrest. Call 911 immediately or visit the local emergency room if you or someone you know may be suffering from an Adderall overdose. Perhaps the group at highest risk for developing a stimulant addiction is college students. A study estimated that 5% to 9% of high school students and 5% to 35% of college students reportedly abused Adderall the year before the study. Between 16% and 29% of students were asked to give away or sell their Adderall obtained by prescription. 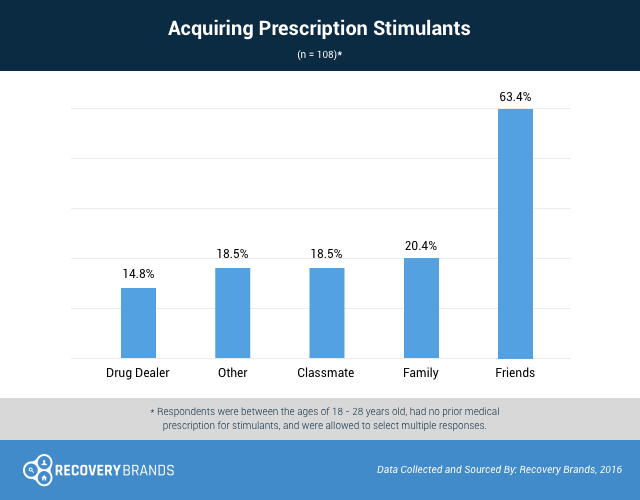 A 2016 Recovery Brands survey found that 63% of people between 18 and 28 years old get access to doctor-prescribed stimulant medications from friends. More than 20% get them from family members, more than 18% from a schoolmate, and more than 14% from a dealer. Those with doctor approval for these medications can keep tabs on their prescribed ADHD medications to protect at-risk young men and women from misuse and its consequences. If you or someone you love is struggling with Adderall abuse, call 1-888-319-2606 Who Answers? to speak with a treatment support specialist about recovery options.
. Morton WA and Stockton GG. Methylphenidate abuse and psychiatric side effects. Primary Care Companion J Clin Psychiatry 2000;2:159-164.
. Volkow ND, Ding YS, Fowler JS, et al. Is methylphenidate like cocaine? Studies on their pharmacokinetics and distribution in the human brain. Arch Gen Psychiatry 1995;52:456-463.
. Sulzer D, Sonders MS, Poulsen NW, Galli A. Mechanisms of neurotransmitter release by amphetamines: A review. Progress in Neurobiol 2005;75:406-433.
. Varga MD. Adderall abuse on college campuses: A comprehensive literature review. J Evidence-Based Social Work 2012;9:293-313.
. American Psychiatric Association. Diagnostic and Statistical Manual of Mental Disorders, 5th ed. Arlington, VA American Psychiatric Publishing, 2013.
. Treatment Improvement Protocol (TIP) Series, No. 45. Center for Substance Abuse Treatment. Rockville (MD): Substance Abuse and Mental Health Services Administration (US); 2006.